I responded that Collections is the way to go in Scrivener, but Michael replied that it’s not as fluidly as OmniFocus’s focus feature. He’s right. I stated boldly that Keyboard Maestro could make a Focus macro. These two macro are controlled with ⇧⌘F to “Focus In” and a slightly different key combination ⇧⌥F to “Focus Out”. 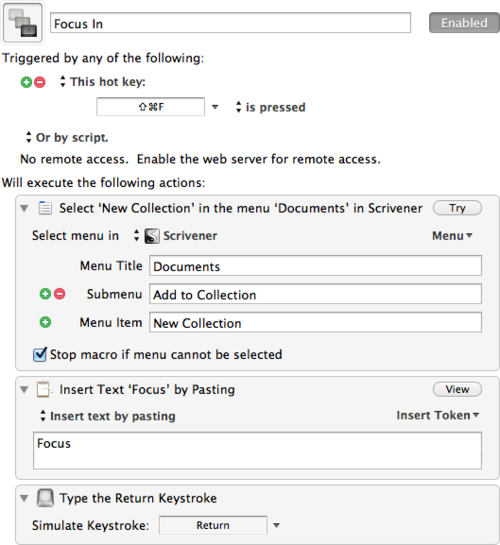 Focus Out needs some manual adjustment since it uses the Move and Click action to click the minus button in Scrivener’s sidebar to remove the Collection Focus In creates. This sidebar has a manual width. 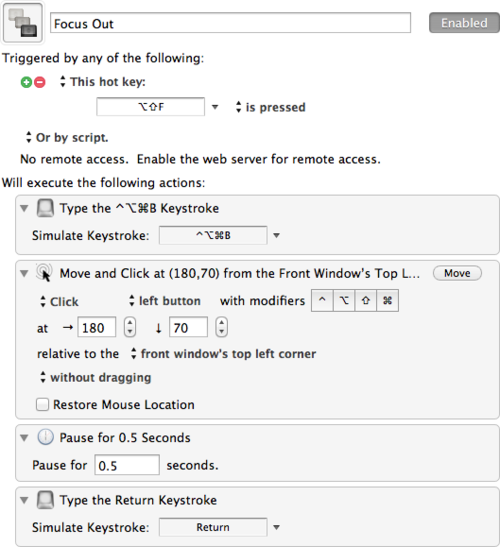 To find your right sidebars’ width select the two last actions in this macro and click Toggle Enable (⌃⌘E). Set the action to Move only and execute the macro. Try to set the X value to where your minus button appears. You shouldn’t have to adjust Y. After that enable the disabled actions and try it out. With these macros you can move Scrivener’s window around. The clicking happens relatively to the top left window corner. Just make sure not to select a different Collection. This macro will always delete without confirmation whatever collection is highlighted! If you accidentally selected a Collection you intended to hang on to…well…it’s gone.